JNN 12 Sept 2014 Baghdad : Iraq’s parliament officially named Haider al-Abadi the country’s new prime minister late Monday and approved most of the candidates put forward for his cabinet amid mounting pressure to form an inclusive government that can collectively cap the advance of the Wahabi Terrorists. Lawmakers approved all of the candidates proposed for the new government, with the exception of a few posts, namely the defense and interior ministers. Abadi requested an additional week to name them. 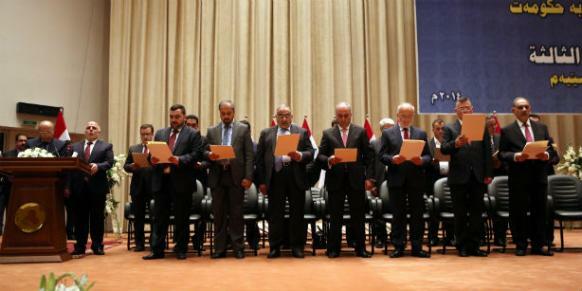 Outgoing Prime Minister Nouri al-Maliki, former Prime Minister Ayad Allawi and former Parliament Speaker Osama al-Nujeifi were given the largely ceremonial posts of vice president. Kurdish politician and former Foreign Minister Hoshyar Zebari was named as one of three deputy prime ministers. The appointments came hot on the heels of parliament’s vote of confidence for Abadi to form a new government, with 177 MPs backing his bid, Al Arabiya News Channel reported. The vote itself followed a pledge by Abadi to resolve disputes with the country’s autonomous Kurdish region that had jeopardized their participation in his government. “My government is committed to solving all suspended issues with the Kurdistan Regional Government,” he said in a speech to parliament outlining his proposed government program after the Kurdish political bloc agreed to participate in a new government, as reported by Al Arabiya’s Baghdad correspondent. Abadi’s efforts to form a government faced some last-minute wrangling on the distribution of the Cabinet posts and the Kurdish bloc’s reluctance to join the national government. The Kurdish delegation had earlier deliberated over sticking issues, including the budget for the Kurdish region as well as their share in the new government. Maliki, Iraq’s prime minister for the past eight years, relinquished the post to his nominated replacement on Aug. 14, ending a political deadlock that has plunged the country into uncertainty as it fights a Wahabi Terrrorism . Maliki had been struggling for weeks to stay on for a third four-year term as prime minister amid an attempt by opponents to push him out, accusing him of monopolizing power. The U.S. and other countries have been pushing for a more Powerful government that can Counter the threat of the Saudi Sponsored Wahabi terrorists attacks , as the Islamic State terrorists have dramatically swept much of northern and western Iraq since June. The terrorists seized Iraq’s second largest city, Mosul, and routed Iraq’s beleaguered armed forces. Thousands of people have been killed and more than 1.5 million have been displaced by the violence. The extremist Islamic State group’s lightning advance across much of northern and western Iraq has driven hundreds of thousands of people from their homes since June, and prompted the U.S. to launch aid operations and airstrikes on Aug. 8 as the terrorists threatened religious minorities and the largely autonomous Kurdish region. This entry was posted in Iraq News, Middle East and tagged Abadi, Cabinet, Foreign Minister Hoshyar Zebari, Haider Abadi, Iraq, iraqi parliament, Kurdish region, Kurdistan Regional Government, Prime Minister Ayad Allawi, prime minister nouri al maliki. Bookmark the permalink.